What HiFi?. Perfect working condition since new. Included with original remote. ULTRA HIGH QUALITY 24 BIT CD PLAYER WITH INSTRUCTIONS IN PERFECT CONDITION. Coaxial digital output for use with offboard DAC, if required. Often tuned and modified, this is original manufacturer's spec. Full working order including all buttons facilities display and remote (back missing from remote battery chamber). VERY HIGH QUALITY CD PLAYER WITH DIGITAL OPTICAL AND COAXIAL OUTPUT, IN VERY GOOD CONDITION. SOUGHT AFTER HIGH QUALITY CD PLAYER KNOWN FOR ITS HIGH SOUND QUALITY, IN GOOD CONDITION. Top player in excellent fully working condition. 1st owner. Primare V70 Audiophile CD /DVD Player. Condition is Used but it looks immaculate. I have used it as a CD transport/player but never tested it as a DVD player. The CD works nicely. It is a very elegant piece of high quality technology with a lovely scandinavian design. Arcam Diva CD-72 T Audiophile Stereo Compact Disc CD Player HiFi Separate - Made In UK. This superb Arcam CD player has been fully and thoroughly tested and cleaned and is in excellent working and physical condition. Marantz PM6006UKSE UK Special Edition integrated Amplifier. Marantz proprietary HDAM-SA3 circuits. Furthermore, the unit includes 2 optical and 1 coaxial digital inputs. Tuned specifically for the UK. The Onkyo DX-C390 is packed full of audiophile grade components and features. These units are highly regarded due to their fantastic cdm2 transport and the amazing TDA1541 DAC chip. Disc format: CD. Channel separation: 100dB. Dynamic range: 96dB. Digital converter: TDA1541, 16 bit, 4 x oversampling. Marantz CD6005 HiFi Separate CD Compact Disc Player inc Warranty. For sale quality audiophile NAD C521i Compact Disc Player in excellent and very clean condition and in full working order. Stunning performance and quality as we can expect from NAD. Digital converter: PCM1710U, Delta Sigma 20 bit, 8 x oversampling. Disc format: CD. This has just had the laser lens cleaned to ensure perfect playback for the new owner. Channel separation: 100dB. This has both digital and analogue audio outputs. Dynamic range: 96dB. Arcam CD72 HiFi Separate Compact Disc CD Player (Black) inc Warranty. It incorporates a rather rare combination of digital filter and DAC -TDA1541A CXD1088Q. It's easily enabled (it's just a connector). The player has been professionally serviced. Full recap of the main PCB - main filter capacitors are Nichicon. Marke TASCAM. 20-second RAM buffer for shock protection. Key original mode allows you to change the speed without changing the pitch. 1-space rackmountable CD player. Slot-loading CD transport. XLR balanced analog outputs (CD-01U Pro). For Sale Rega Jupiter CD high end transport complete with DAC in the Box all in very good condition. "The Rega Jupiter just sounds right, natural, as it should, proving itself good value over and over again". UNIT IS IN USED CONDITION. TESTED & WORKING. ORIGINAL REMOTE INCLUDED. GREAT HIGH QUALITY SOUNDING CD PLAYER. 24 BIT DAC. NCIE UNIT OVERALL. THE TOP OF THE CASE LOOKS A LITTLE FADED OR DISCOLOURED. In short, this CD player's internal sophistication is on a level generally found on much more expensive models. This achieves the lowest possible noise interference and thus highest sound quality of the analogue audio output. Arcam CD 72 HiFi Separate Compact Disc CD Player (Silver) inc Warranty. Sony CDP-D11 studio CD player with rare original working remote. Worldwide delivery available, please ask for quote if not listed. One of my favourite CD players, in perfect working order. Sounds superb. Crack in Perspex window, see photo, but display OK. Some wear marks, as per photos and normal with rack mounted kit. Rack ears are removable. Theta Jade daVid cd transport. This is a superb unit featuring the famous TDA-1541A S1 Single Crown DAC chip (pic. I have not seen one go faulty yet. For sale is QUAD 66 CD Player. There are virtually no marks on this player and it presents almost as new. ). Here is my Kenwood DP-7010 modified and upgraded in very good working conditions andsounds very nice too. This player is upgraded and modified. The chassis sits on vibration isolators built into the feet that makes huge difference. Don't miss it! Channel Separation 100dB. Scratches on the surface. CD tray cover is slow to open. "6 1" Music bank system. Acoustic isolation system. THD Noise(1kHz) 0.003%. THD(1kHz) 0.0025%. Channel separation: 90dB. Disc format: CD. Frequency response: 20Hz to 20kHz. If you can't find it then give us a call and we will find it for you. We are based in Finsbury Park. We do free diagnoses and we fix on "No Fix, No Fee" basis. 1 x Pioneer PDR-609 (S/N 4977729535433). A solid partner for making you own CD's, the PDR-609 is equipped with a 24-bit A/D converter and Legato Link Conversion to make the purest digital recordings. In near to 'MINT' condition! Made In FRANCE, 220-230V but can be switched to 110-120V. 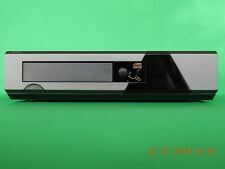 Used Sony scd-xb940 CD/SACD player. Full working condition. There are two RCA (not gilt) for analogue signal, digital optical output jack TosLink and slot for 3,5 mm mini-jack, marked "CD-DECK SYNCHRO", on the back panel of the player. Have you already guessed for what it is?. NAD C 542 CD Player. Depth: 40 cm. Width: 43.4 cm. Headphone jack. Coaxial and optical digital output. 3-mode random playback. MHZS CD33K 2 x 6N3 Tubes HDCD CD player AUDIOPHILE UPGRADED OPAMP AND CAPS! Look to photos about actual item. Small dent on one side, otherwise perfect. 2010S2 CD PlayerFeatures. Available in black or titanium. CD display can be turned off for improved sound quality. Total Harmonic Distortion : <0.008%, 20Hz - 20KHz, 0dBFs. Output Level : 2V RMS. Also known as DAC 7. From a current output of a DAC chip (after passive I/U conversion using paired. It's heavy, feels substantial, has big, clear display and. of audio manufacturer's as Sony, Marantz, Technics, Denon - a far cry from. ).